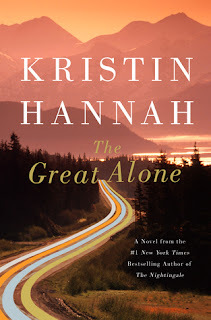 The Great Alone by Kristin Hannah is one of twenty novels published by the author being highlighted this month in a local event called PIERCE READS 2019! I chose to read this book, among the many choices because I had already read, and loved, her The Nightingale, set in France during WWII. Her other novels seemed a bit too romance-y for my taste and The Great Alone was the book being highlighted through library activities, mostly book club-type discussions. That seemed like reason enough for my choice but as coincidence would have it, the hold I'd placed months ago on the audiobook became available. No excuses now, I had three weeks to read and digest it before it was due back at the library. I started off listening to the audiobook but soon switched to reading the print version. The audiobook narration was too slow and I needed to consume the story quickly. Why? Well, because of the aforementioned due date but also because the story-line called at a sprint not a dawdle. The story begins in 1974. (Hey, I was in high school at the time. But who care?) Leni is thirteen-years-old and friendless. She and her parents have moved so many times since her dad got back from Vietnam, where he was a P.O.W. for several years. It was impossible to make friends or fit in at a school. So why bother trying? Her father, Ernt, has frequent nightmares and can't seem to hold down a job. Her mother, Cora, goes along with Ernt's schemes because she loves him and doesn't want to rock the boat. When Ernt learns that one of his pals from 'Nam willed him a cabin and land in the Alaskan bush, he wants to go. So the family packs up their VW bus and with very little preparation heads north. For a short time, the move and the exhilaration of getting settled which required a lot of hard work, Ernt seems like a new man, but then the dark Alaskan winter descends. The demons return, this time with a hardened meanness. Cora is often the victim of his anger and his fist. The community near their cabin is made up of a cast of characters: Mad Earl and his family are the survivalist sort; Large Marge, a black woman who has dropped out of corporate America and runs the small store in town; Tom Walker, the richest man in the area who views change and inevitable and wants to benefit from it; and Matthew Walker, Leni's first and best friend is Tom's son. Everyone of the characters is either good or bad. I was reminded of the scene from the movie "The Santa Clause" where the Tim Allen character has become the new Santa Claus and he is walking through town. Each person he comes to he knows instantly if they are naughty or nice. Leni, Large Marge, and Tom Walker are all nice, while Ernt and Mad Earl are not! Over time, Leni really finds a place for herself in Alaska but has to tiptoe around her father, who is getting more and more irrational as time goes by. As she prepares for the time when she and Matthew will go away for college, she worries about leaving her mother alone with her father. Then tragedy strikes and plans are turned on their head. While high overhead, green, yellow and red, the North Lights swept in bars? The descriptions of life for Leni and her family in Alaska certainly reflect that feeling about being alone in a huge place. Frequently they refer to a line attributed to Jack London: "There are a thousand ways to die in Alaska." Danger and drama are right outside the door. Yet the descriptions of the beauty and freedom are also remarkable. Apparently Kristin Hannah's family made a move to Alaska in the 1980s, not all too dissimilar than what Leni's family did, so she speaks with some authority and authenticity. A friend (M) from book club told me that she likes, not loves, The Great Alone. She likes the bits where living in Alaska are described but the other parts not so much. The reviewer Janet Maslin (New York Times) describes the book as "borderline young adult." As I read those words I finally understood what it was that I disliked about the book. In YA lit characters are more likely to be one thing (happy/miserable; awkward/capable) rather than nuanced. Situations are more one-note. And YA novels usually end on a positive, if not a Hollywood note. In The Great Alone there are terrible troubles but, in the end, things get wrapped up in a bow. But, to be fair, I admit that no one wants to read a book that is all about horrors with no happiness at all. Another irritant that M. identified was the frequent seventies references. Hot pants, waffle-stompers, bell bottoms, and Polaroid cameras were mentioned often yet the news of the era was not. We never hear that the Vietnam War ends during the time period of the book, or that Nixon is impeached, or any other big news items occurring during that time period. Perhaps that was intentional. Life in the Alaskan bush certainly seemed disassociated from life elsewhere in the USA. Taking into consideration the good and the not-so-good aspects, I gave the book 4 stars. I know it will generate a good discussion in both of my clubs and I look forward to attending the author event to hear Kristin Hannah talk about her own experiences in Alaska. Have you read The Great Alone? The Nightingale? Any of her other books? Which did you like best and why? I too read & liked The Nightingale but have been hesitant about this one for some reason: I like the idea of the Alaska part but maybe not the subject matter or abuse part. So it seems you had to weigh some of the positives & negatives too. I'd say that parts of the book are over-written and the fact that everyone is either good or bad seems so simplistic. The abuse is bad but the descriptions of the abuse aren't too graphic. Oh, you know that I LOVED The Nightingale! I'm only one chapter into this one. My skewed view of Alaska from a cruise ship is my only comparison. I concur with your review. The 70s references were clunky and seemed manipulative. It does read like a YA book, overwritten in spots and it tries too hard to paint the people with broad brush strokes. Not nuanced at all. I would give it 3 1/2 stars, although I'm only halfway through it.